The publication of Dampier’s Monkey: The South Seas Voyages of William Dampier by Adrian Mitchell is not just of interest to readers keen on Australian history, it’s timely for another reason. Starting in 2013, Australian teachers will begin teaching the new national Australian Curriculum, and so any primary school teacher under the age of 40 will probably need to learn something about the history of European Exploration. It was, I believe, last taught as a compulsory topic in the 1956 Course of Study when students of my vintage laboriously traced maps into exercise books and with coloured pencils marked the voyages of assorted explorers across the world’s oceans. I found it fascinating because of Miss Baird, who told us tales of high adventure, danger and mayhem while we struggled to keep those dotted lines even and in the right place. I loved Miss Baird. She was young and pretty, and, I now realise, she had taken the trouble to jazz up her lessons by doing some background reading that went beyond the dry facts mandated by the Victorian Department of Education. But as Adrian Mitchell’s book makes clear, Dampier deserves better. Even though the biographical details are a bit scanty, and Dampier himself rejected any suggestion that he was a rogue, enough is known about him for us to be sure that he was more than a bit disreputable, which – let’s face it – makes him much more interesting for kids to learn about than the respectable Captain Cook! Like all buccaneers, Dampier navigated the world’s oceans in the hope of making money, and he was especially keen on finding precious metals, i.e. gold and silver. His New Holland Plan was, clearly, to make his fortune in this new world, and that meant finding gold, preferably gold already dug up by accommodating natives who could be persuaded by one means or another to part with it. This ambition cost him a significant place in the history of Australian exploration, and for a reason I could never have guessed. Though he occasionally found it handy to use sailors’ superstitions to persuade others to do what he wanted, Dampier was a rational man who made his decisions on the basis of known evidence. He sailed north and not south because he reasoned that ‘the gold and silver which the new continent must surely contain would be in the tropic latitudes, as everywhere else around the world’ (p125). This ‘concept of geology determined by geographic zone’ with ‘echoes of an older, medieval notion of some correlation between warmth and mineral wealth’ (p126) precluded Western Australia’s Kalgoorlie and South Africa’s Johannesburg as well as California and the Klondike in the Northern hemisphere, not to mention the lucrative Victorian goldfields of Ballarat and Bendigo and Bathurst in New South Wales. What Mitchell does is to analyse Dampier’s journals and his published books to discover discrepancies between them. Dampier began sailing at a time when a blind eye was turned towards buccaneering; the spoils it brought benefitted cash-strapped kings and it led to the development of all-important trade. But James II issued a proclamation against piracy, and Dampier was hauled before the Board of Trade twice (1697 and 1698) and court-martialled too in 1702. 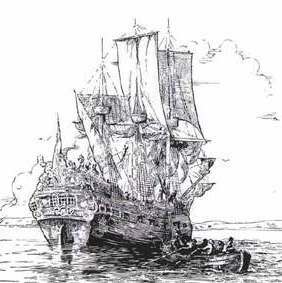 It was his books which saved him and his reputation: while the pirate Captain Kidd was strung up and his body left in chains on display to warn others not to replicate his crimes, Dampier was a guest of Samuel Pepys in 1698 and presented to Queen Anne in 1703. His journals are the key to this differential treatment: while his style was influenced by The Voyages and Travels of Sir John Mandeville, a book of marvels and monsters based on Mandeville’s supposed travels first circulated between 1357 and 1371, , Dampier’s books documented marvels that he had seen and actually knew about, based on the careful observations in his ship journals. New Voyage Round the World (1697) and its successors Voyages and Discoveries (1699) and the two-part Voyage to New Holland (1703 and 1709) were written to captivate his readers with artful descriptions of massive birds and peculiar animals, but in a rational and coherent way. Dampier was arguably the first of the great travel writers. Mitchell also includes a very interesting chapter about the words that Dampier introduced into English. He was very keen to report back using the indigenous words for things, and this is how we have the word ‘gong’ and also ‘barbecue’! The cover illustration is of Norman Lindsay’s The Landing of Dampier (1925), and there are also some interesting reproductions of maps and engravings from Dampier’s books, including one accompanying his record of sailing through a violent storm to Aceh after being deliberately marooned on Nicobar Island. Dampier and his Companions in their Canoe, overtaken by a dreadfull Storm (1777) which (unlike most of the rest of them) is actually in the National Library of Australia. Dampier’s Monkey: The South Seas Voyages is a scholarly work and here and there it’s a bit arcane, a bit opaque for a general reader. If you’re trying to find a simple summary of why Dampier matters in the history of Australian exploration then this is not the book for you. But to discover the life and interests of a complex, influential and morally ambiguous man who played an important part in the development of natural science, linguistics and anthropology, it is worth the effort. Miss Baird would have thought so. She’s actually the only teacher whose name I remember from the patchwork of primary schools I attended across three continents. Her approach has to be worth emulating, I would say. Fishpond: Dampier’s Monkey: The South Seas Voyages of William Dampier or direct from Wakefield Press. This sounds fascinating! I learned all about Marco Polo, Columbus, Magellan, & deGama as well the standard roster of those who explored Canada’s coast & interior, but I’ve never heard of Dampier. His sounds like a wonderful story. You’ve done a fabulous job at reviewing this book and whetting my appetite! It is interesting to see more attention give to European exploration prior to the arrival of Cook, because quite frankly we could just as easily have ended up being a Dutch or French colony. Growing up in WA we knew about Dirk Hartog landing, and a few others, but I think there is always room for more exploration of the exploits of those explorers. I was reading a novel about pirates not too long ago and saw that there was a mention of Dampier in there. Whilst I had heard of him prior to that, I didn’t know that he had been a buccaneer! This sounds like it could be a good way to learn more! Hi Marg, I’m hoping that Wakefield might produce a children’s version of this, such a fascinating man, and yes, I think many people would like to know more about early venturers to our shores. Of interest to me to read your well-composed essay — more than a book review — as I am attempting to determine what mariner travelled most nautical miles in that age of discovery. Finding Dampier circumnavigated three times will land him on a short list, somewhat about equal to Cook who didn’t finish the third voyage. Are you writing a book about this? Hi Lisa, thanks for a great review, Dampier was definitely a fascinating character. I think it’s important for us Aussies to understand the true history of discovery and exploration in this country. Lisa, are you still on deck? I have just discovered your admirable advocacy of Dampier in your review of Dampier’s Monkey by Adrian Mitchell. For a Sandgroper who has lived in Dampier territory in the North West, familiar with Shark Bay, Dampier town, Dampier Archipelago (I have trodden in his footsteps on East Lewis Island), Roebuck Bay, and Dampier Peninsula your essay is a welcome call to recognise one of the great navigators, the first to record accurately in a “scientific” way, his discoveries. Mitchell’s “Monkey” is a brilliant work setting the historical circumstances of Dampier’s era of buccaneers and pirates, the politics and philosophies of that era of international expansion and ‘discovery’ around the globe. But as you say, it is scholarly and more than a bit arcane except for Dampier fanatics like me. If you are looking for a text to introduce Dampier to students, try Alex George’s William Dampier in New Holland – Australia’s first natural historian (Bloomings Books 1999). A modern day detective story to identify the plants he collected (the first scientific specimens from Australia) and the creatures he saw. My only beef with Mitchell is his armchair misinterpretation of several of Dampier’s observations as being unscientific and contradicting his claim to be the first accurate recorder of what he saw, other navigator-explorers before him having reported in fanciful terms. On page 32, Mitchell nitpicks Dampier’s description of a waterspout as being “as thick as a man’s arm”. Big man, small man, doesn’t matter. When you hold your forearm up to gauge the size of a waterspout and it’s as thick as your arm you know it is going to blow your ship apart if it comes your way. No need for exactitude. The arm, hand, finger method of describing distance, size or inclination is well known: our State astronomer recently described a star as being two stacked fists above the horizon. Likewise Mitchell criticises the description of a snake as “as big as an ordinary man’s waist”. Of course a python is that diameter after swallowing a pig, or in our case an amethyst python swallowing a wallaby. “He was not always able to interpret what he saw in the calm dispassionate light of modern science” (p.38) is contradicted by a description of a two-headed snake snake that Mitchell poo-poos but any naturalist would recognise instantly as a blind snake, Typhlops or relative. I have a smaller version in my back yard. Bahia in Brazil is home to a couple of species of Leptotyphlops, one was only recently rediscovered. Dampier’s accurate description of our common friendly bobtail lizard, or shingleback (Tiliqua rugosa), gets a florid treatment by Mitchell (p.39-40): “…he is determined on elaborating the comparison he has disallowed. … Everything about this description puts it outside the periphery of the Royal Society’s tolerance”. Mitchell doesn’t say what this tolerance level is, but I’m sure they would have tolerated his plant specimens from Dirk Hartog Island at Shark Bay that are the first botanical (or any other life form) specimens from Australia, and would have had him address them had the politics been positive. So, in summary, Mitchell has done great service in setting the scene for Dampier’s political and pre-scientific era, and publishing his journal (no problem reading the eccentric spelling for those of us who studied Chaucer in high school), but Miss Baird might have suggested he should consult a naturalist before finding fault with Dampier’s descriptions of nature. Hello Charles, yes indeed I am still on deck (but now blissfully retired instead of still teaching). I loved this book, (and everything else that Adrian Mitchell has written) but I also enjoyed your taking him to task for his ‘misdemeanours’ – I take your point about waterspouts! I wish the ABC would make a program about Dampier, he surely is the most interesting of our explorers, and one most fitting fora nation of larrikins. On Dampier (what a fascinating character) I am reading The Cygnet Adventure by Alan Chester. A very good read based on Dampier sailing as a buccaneer and landing at north-west Australia. Hello John, that sounds very interesting. As a teacher I could never understand why the curriculum wasn’t more interested in Dampier. Of all our maritime explorers, he was the one that my students liked the best! It is wonderful to find Dampier back on the agenda, thanks John and Lisa. I have just returned from the Shark Bay area where Dirk Hartog (1616) and de Vlaming (1697) get all the press (well, they were first and second in the race) but Dampier (1699) is not so well feted even though he made the first “scientific” observations and records of flora and fauna in Australia and detailed soundings and charts of the area. Charles Darwin respected Dampier’s accounts (see Preston p.453). I was at Shark Bay in the company of Darwin’s great-great-grandson Christopher. Yes, history is alive and well. “A New Voyage Round the World” William Dampier, published by Adam & Charles Black 1937, wherein Dampier describes the northwest coast of Autralia accurately but unfavourably from a colonial perspective. I know, I lived there. Dampier is much quoted as describing the Bardi people as “the miserablest People in the world”. His long description is accurate of their circumstances but must be read in the language of the day. “Miserable” from the Latin miserabilis meaning worthy of pity, because they didn’t have the trappings of European civilisation and Dampier’s purpose wasn’t to discover their rich culture in a bountiful land if you knew how to find your tucker. “A Voyage to New Holland”, William Dampier, 1989 Alan Sutton (a State Library discard, can you believe that? Nobody borrowed it so they chucked it out. Fortunately it landed in my library). “William Dampier”, Christopher Lloyd 1966 Faber & Faber. A succinct biography by a naval historian. “A Pirate of Exquisite Mind – the life of William Dampier”, Diana & Michael Preston, Corgi 2005 (Doubleday 2004) This is regaded as the definitive biography. “William Dampier in New Holland – Australia’s first natural historian” Alex S. George, Blooming Books 1999. Retraces Dampier’s plant collections and identifies them all. Essential reading for ecologists. “Dampier’s Monkey” Adrian Mitchell, Wakefield Press 2010. A magnificent tome from a home-grown publisher containing Dampier’s journals and Mitchell’s erudite exposition of the era of buccaneering. Geraldine Barnes at Sydney Uni has several papers on Dampier as the first “post-mediaeval-monstrous” recorder of the world. I don’t agree with her or Mitchell on their interpretations of some Dampier’s observations but I applaud their work to put Dampier at the pinnacle of post-medieaval recorders of the natural world. Every Australian should know him and respect him. He had our essential derring-do with scientific savvy. He wrote our first Australian literature in his journals and books. Wow, that is an impressive list and a useful contribution for anyone searching for references about Dampier if they land here while in pursuit. I like what you say about his derring-do. You’re right: he fits nicely into our ‘larrikin’ narrative.